I know I’m not the first to say it, and I totally agree—the comparisons to Gone Girl are way off. Sure, it’s a messed up marriage, like in Gone Girl. 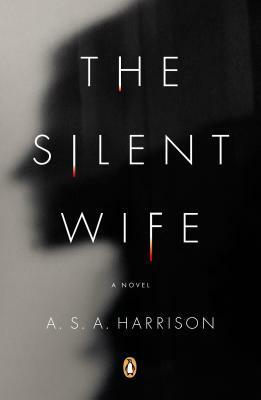 But The Silent Wife is less thriller than Gone Girl, for starters. While the final “act” is set up in the blurb above (and I kind of wish the blurb hadn’t given that away), Jodi and Todd are less conniving and sociopathic than Amy and Nick, but still pretty awful to each other. Psychology is a huge element in this novel, with Jodi even being a psychologist herself. There were plenty of twists and turns in the story but I saw a few of them coming, and the ending wrapped up just a little too neatly for me. This was deliciously dark fiction, though, with plenty of sinister moments, and Harrison’s writing style and pacing keeps you turning the pages for more. I loved how she made Chicago another character in the story, mentioning specific locations, however, the language wasn’t quite right for Chicagoans in spots. I didn’t grow up in Chicago but I’ve been many, many times to visit family there, and never once have I heard anyone I know from Chicago say “hell’s bells.” This would make a great book club choice, since there’s a lot to discuss: cheating and what you do or don’t do about it, what a marriage looks like after 20+ years, childhood trauma, and so on. The Silent Wife came out a couple of years ago so I’m sure many have read it already, but I don’t want to give out spoilers! Basically it was a good book—not quite great, but still an enjoyable read if you’re into dark fiction about marriages and interpersonal relationships. I was sorry to find out later that Harrison died right before The Silent Wife was published, making it her only novel. I would have been interested to read more from her as she developed her style and voice past her debut. The Silent Wife is my fifth book of five for the KC Library’s Love on the Rocks Adult Winter Reading Program. Read from March 15 to 20, 2015. This entry was posted in books and tagged 2015 kc library challenge, drama, fiction, literature, love, marriage, midwest, psychological thriller, psychology by kristin @ my little heart melodies. Bookmark the permalink. This one was just sort of “meh” for me. Definitely not anything mind blowing. Agreed. Fun enough for what it was, nothing that would end up as a favorite for me. I think it just fit for me better when I read it because I needed something that I didn’t have to work too hard for. You know? I really liked this one, although I agree that the constant comparisons to Gone Girl really did it a disservice. It was similarly paced, but other than that…not much was similar. That being said, I kind of liked that you knew what was going to happen in the end, and you were just left speculating about when and how. I think it was an interesting choice. Especially considering how it ends up happening! Agreed, besides the whole “messed up spouses” part, I’m not sure it comes even close to the thrill ride that is Gone Girl. Glad you enjoyed this one, too!